Sarin is a nerve gas, a deadly poison. It was designed as a chemical weapon for use in war by Nazi Germany. It has been classified as a weapon of mass destruction in UN Resolution 687. Production and stockpiling of sarin was outlawed by the Chemical Weapons Convention of 1993, and it is classified as a Schedule 1 substance. Sarin can be lethal even at very low concentrations. Death comes in 1 to 10 minutes after breathing it in. It paralyses lung muscles. Antidotes, such as atropine, can save a person if given immediately. People who get a non-lethal dose, but do not get immediate treatment, may suffer permanent neurological damage. Like other nerve agents, sarin attacks the nervous system by stopping nerve endings in muscles from switching off. Death will usually occur as a result of asphyxia due to the inability to control the muscles involved in breathing function. In vertebrates, acetylcholine is the neurotransmitter used at the neuromuscular junction, where signals are transmitted between neurons from the central nervous system to muscle fibres. Normally, acetylcholine is released from the neuron to stimulate the muscle, after which it is degraded by acetylcholinesterase. This allows the muscle to relax. 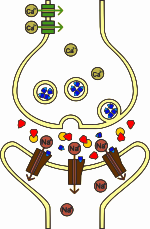 Inhibition of cholinesterase means the neurotransmitter continues to act on the muscle fibre. This stops breathing. Sarin was discovered in 1938 in Wuppertal-Elberfeld in Germany by scientists at IG Farben attempting to create stronger pesticides. it is the most toxic of the four G-Series nerve agents made by Germany. In mid-1939, the formula for the agent was passed to the chemical warfare section of the German Army Weapons Office, which ordered that it be brought into mass production for wartime use. It was not used in World War II. April 1988: Sarin was used four times against Iranian soldiers in April 1988 at the end of the Iran–Iraq War. It helped Iraqi forces retake control of the al-Faw Peninsula during the Second Battle of al-Faw. Using satellite imagery, the United States assisted Iraqi forces to find the position of the Iranian troops during those attacks. 1995: Japanese cult Aum Shinrikyo released an impure form of sarin in Matsumoto, Nagano, killing eight people and harming over 200. Muscle spasms (the muscles get very tight and painful). Eventually the muscles can become paralyzed. This can make it impossible for a person to control the muscles needed for breathing. If this happens, breathing will stop and the person can die because they are not able to breathe in oxygen. ↑ "Chemical weapons 101: Six facts about sarin and Syria's stockpile". CS Monitor. 21 August 2013. ↑ 4.0 4.1 "Nerve Agents" (PDF). www.sjcphs.org. San Joaquin County Public Health Services. Retrieved December 26, 2015. Wikimedia Commons has media related to Sarin. This page was last changed on 18 July 2018, at 07:17.